This weekend’s Record-Gazette (Banning, Beaumont, Cherry Valley, Cabazon, Calif.) carries a story about the merger of two churches — Hope Community Church and Grace Brethren Church (Cherry Valley) — into one new congregation — Grace Fellowship Church. A portion of the story appears below. Click here to read the complete article. It was a chance encounter that brought Dan Ruiz to Hope Community Church in Cherry Valley several years ago. It was 2008, and the tiny congregation wasn’t listed anywhere where he would have noticed it, and the small building that is now home to a Jazzercise program just kind of popped up out of nowhere. “What’s this?” he and his wife, Kassi, wondered, stopping to check things out. The congregation was a younger crowd, and they were hungry for a quality pastor — and practically demanded him to join them on the spot. “I happened upon them while I was surveying the Pass,” he says. 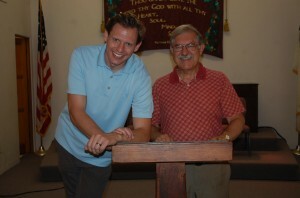 “Their pastor was retiring,” and the church begged him to assume his position. Ruiz was still studying to become a minister, and for the next six months as he finished up his training at Temple Baptist Seminary in Chattanooga, Tenn., he kept in touch with his future congregation. “I prayed about it,” he says, and eventually accepted the pastoral position there. Under his watch, the group outgrew their location, and made arrangements to begin meeting in a multipurpose room at Cherry Valley Grace Brethren Church, where they have now met for the past two years. Grace Brethren, established in 1949, meets in a church that was built in 1950, and consists of a mostly older congregation that has been shrinking through attrition, according to the church’s pastor, Roy Polman. Both congregations have roughly 50 members. Both congregations have been meeting simultaneously in separate areas on campus. “We figured that it would make sense for us to leave our General Association of Regular Baptists and join the fellowship of Grace Brethren churches,” Ruiz says. According to the two, negotiations have been ongoing for the past year to merge the two congregations.